Takeaway: Recent advancements in liquid nylon multipolymer coatings not only improve upon their anti-corrosion characteristics, but they are also formulated with more environmentally friendly ingredients. The purpose of any coating is to protect substrates from detrimental elements. Although many types of coatings have been available for decades, promising new formulations of liquid nylon multipolymer coatings offer advantages of special interest to the transportation and renewable energy industry sectors. Nylon is a lightweight synthetic thermoplastic polymer developed at E. I. du Pont de Nemours and Company in 1930. Seen most often by consumers in its solid phase, nylon is used to make numerous products such as toothbrushes, machine parts, rope, fabrics, and of course, nylon stockings. A polymer is a high molecular weight compound with repeating units. Compounds with only a single type of structure for the repeating units are known as homopolymers, with polystyrene being a common example. Multipolymers, also known as multimers, contain many types of repeating structures. In their liquid form, nylon multipolymers are useful as a coating that can be applied by several means, including paintbrush, paint roller, dipping, and fill and drain. They are also sprayable, which make them easier to apply than many of the existing sealants or waxes in the market. The primary benefit of liquid nylon coatings are that they produce a flexible, tough coating that provides an impervious barrier against corrosion, friction and electrical conductivity. The coating forms a mechanical bond with any lightly abraded surface including metals, plastics, fabrics and composites. Another benefit is abrasion resistance to reduce friction and wear between two parts in an assembly. Liquid nylon multipolymer coatings are not electrically conductive, so they can be safely used in electrical infrastructure (e.g., to coat terminals and connectors in junction boxes) and electronic devices. Finally, these coatings dry quickly (one hour until tack-free, fully cured in 72 hours) and perform well across a wide temperature range. Commercially available products tolerate temperatures ranging from -70°F to 300°F (-57°C to 149°C). They can also be custom tinted for easy visibility when in service. 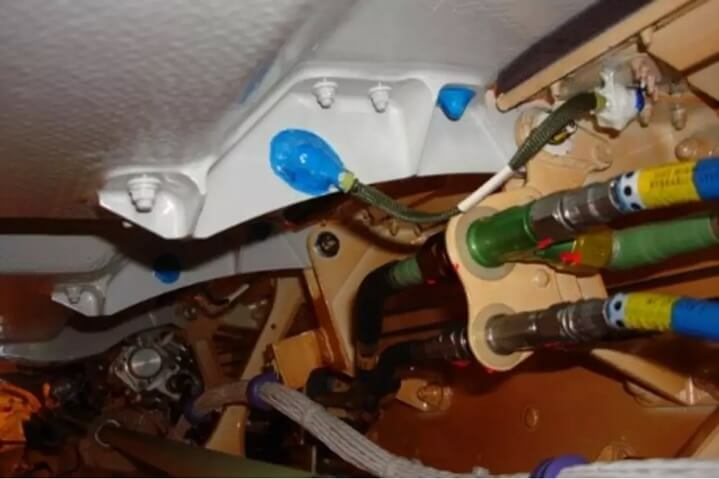 Aviation and Aerospace – As a thin-film lubricant on flap tracks, and as an insulating sealer in airplane wire harness assemblies, electrical connection installations, metal fasteners, radomes and landing gear. They are also used to provide an abrasion-resistant covering on cargo bay floors. Figure 1. Blue-tinted liquid nylon multipolymer coating applied to electrical connectors. Automotive and Heavy Machinery – Provides a corrosion barrier on vehicle undercarriages, brake rotors and fuel tanks – all of which are periodically subjected to water and highly corrosive road de-icing chemicals. The coating replaces grease, and does not need to be reapplied for up to ten years. Rail – Liquid nylon coatings have been used on emergency evacuation systems in the railway sector. Renewable Energy – As limited fossil fuel supplies are depleted and the public’s concern for greenhouse gas emissions rise, more communities and industries are starting to examine the promising advantages of renewable energy sources such as wind turbines and solar energy panels. Liquid nylon coatings are suitable for protecting subcomponents such as grounding straps and connectors that are found in solar energy panels, wind farms and fuel cells. Anti-corrosion coatings for any vehicle or aircraft must stand up to intense weather, ice and dramatic temperature gradients. Switching to renewable energy brings its own set of challenges regarding the weather because wind and solar energy systems are often placed in remote locations and exposed to the elements. Anti-corrosion coatings must stand up to substances such as jet fuel, kerosene, phosphate ester hydraulic fluid, lubricants, de-icing chemicals, salt spray and water. Uniform corrosion – A type of corrosive surface attack where the corroded areas occur in a manner evenly distributed across the material being attacked. Intergranular stress corrosion cracking (IGSCC) – A type of corrosion due to applied forces on the granular boundaries of a material. Filiform corrosion – Also known as underfilm corrosion, it is common to aluminum alloys that utilize an organic form of coating in conditions with a high level of humidity. Galvanic corrosion – Occurs when two different metals are in electrical contact in an electrolyte, where the more noble metal is protected and the more active metal tends to corrode. Also known as dissimilar metal corrosion, it can be minimized by insulating the two metals with a coating. Deposit corrosion – Can be very aggressive and is often seen around fasteners and screws. These industry sectors face some of the most daunting regulations. Products, both at the time of assembly and for the aftermarket, often must be tested, certified and approved by government agencies at great expense to the manufacturer. Bringing a “new and improved” coating to market is not for the faint-hearted. Many coatings, paint thinners and solvents contain volatile organic compounds (VOCs), which are toxic organic chemicals that are emitted as gases from certain chemicals. Some coatings have historically included high-density heavy metals such as chromium as a pigment and for their corrosion-prevention characteristics, but these heavy metals can be released into the environment as the VOCs evaporate, and subsequently cause a health hazard. When not properly disposed, coatings with heavy metals can make their way into the water supply. Long-term exposure to chromium is known to cause kidney and liver damage. Government agencies and coating manufacturers have recognized the need to eliminate heavy metals due to the VOCs. In this context, the goal is to use only environmentally friendly ingredients to produce a clear nylon coating while retaining all the desirable characteristics of previous products. Liquid nylon multipolymers have fewer VOCs than coatings containing heavy metals (including chromium). When selecting these coatings, look for compliance with the European Union VOC Solvents Emissions Directive, the International Air Transport Association (IATA) regulations, and the Registration, Evaluation, Authorisation and Restriction of Chemicals (European Community REACH) regulations. Liquid nylon multipolymer coatings already offer several benefits over traditional coatings in the transportation and renewable energy industries. Recent advancements in these products not only improve upon their anti-corrosion characteristics, but are also formulated with more environmentally friendly ingredients.